The 26.2 metre motor yacht Scorpio has been sold with Philippe Chadel at Yachtside in France acting for the buyer and seller. 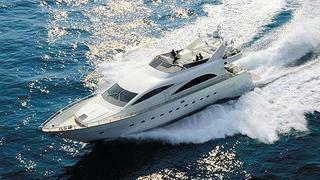 Built in GRP by Italian yard Permare, Scorpio was delivered in 2006 as one of the yard's Amer 86' series. An interior in high gloss mahogany accommodates eight guests in four cabins consisting of a master suite, VIP suite and two twins, all with televisions, DVD systems and full en suite facilities. The saloon and dining area are open plan with a very fluid, contemporary feel. The lounge is aft featuring a plush U-shaped sofa and coffee table to port, with a large flat screen television to starboard. A low island credenza separates the lounge and dining area where up to eight guests can comfortably dine at the formal table. The aft deck offers a shaded al fresco dining option which can easily be opened to the saloon through sliding glass doors. The flybridge is well equipped, with plenty of areas to relax, including large sun pads, an al fresco dining area, additional seating and a wet bar. Twin 1,670hp Caterpillar engines give her a cruising speed of 28 knots. Scorpio was asking €1.2 million.